Continuous renewed skin is just a click away. 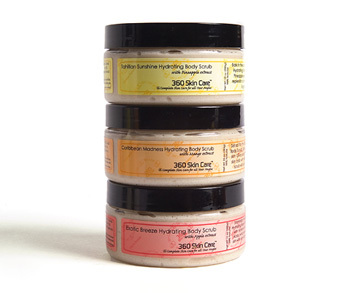 360 Skin Care Scrubalicious Resurfacing Collection is a grouping of 3 of our 10 scrumptious scrubs. Our package give the power to combine any 3 scrubs from all our collects together in a bundled to save. Feel like celebrating today choose our Carnaval Extravaganza Rub, need to relax and unwind, choose our Lavender Dreams Hydrating Scrub. The choice is your. Our bundled collection gives you a savings of 5% of purchasing each product individually.